This official First Day Cover includes the innovative mini sheet celebrating the BLOODHOUND project and its connections to the Isle of Man. The sheet is cancelled with the first day of issue, and it features a unique postmark inspired by the BLOODHOUND logo design. 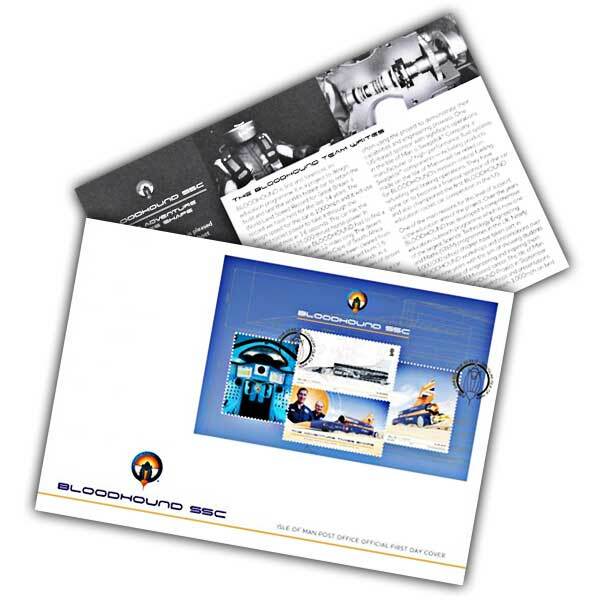 Inside the envelope is a card detailing the project, composed by the BLOODHOUND group, and featuring details of Swagelok's participation and a contribution from Adrian Moore, Chairman of the Isle of Man Aerospace Cluster about how BLOODHOUND can inspire and inform. 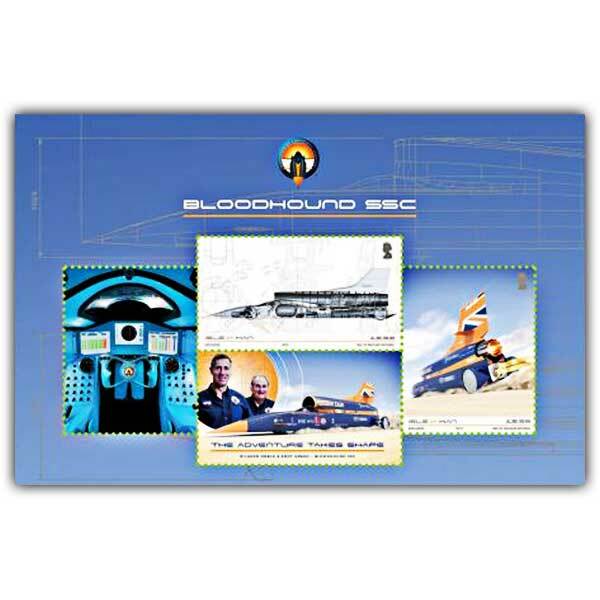 The sheet includes two stamps showing the BLOODHOUND car and two labels, with one featuring the famous Richard Noble and existing world record holder Andy Green, BLOODHOUND's driver. The design encapsulates the engineering quality associated with the project and reflects the development by consisting of 3 unique print surfaces; metal ink, varnish and thermochromic ink, which vanishes when heated up to expose the inside of the BLOODHOUND car. Behind the images lie technical line illustrations underlining that this is a showcase of the engineering prowess included, in addition to of the ambition of setting brand-new records.